Yankees without rings. Doesn’t sound right; there’s no ring to it. Yes, it’s a short list. But there are some very good ballplayers who wore the pinstripes and yet missed out on the World Series victories. The list includes a Hall of Fame pitcher, an AL MVP and batting champ, a Rookie of the Year, 20-game winners and 40-home run hittes. 1. Don Mattingly — Spent his entire 14-year career with the Yankees, but made his only playoff appearance in the 1995 wild card round (when he hit .417). A .307 lifetime hitter with 222 home runs, Donnie Baseball, right. was a batting champ in 1984, AL MVP in 1985, and a nine-time Gold Glove winner at first base. The captain just missed out on the 1996 championship, the Yanks first in 18 years. 2. Bobby Murcer — Joined the club as a 19-year -old rookie in 1965, the year the Yankee dynasty collapsed. He was traded to the Giants for Bobby Bonds in 1975, but returned four years later after a stint with the Cubs. Some 175 of Murcer’s 252 career home runs came as a Yankee, and he was a .277 lifetime hitter. Murcer made his only World Series appearance in a 1981 loss to the Dodgers. 3. Mel Stottlemyre — Came up as a rookie in August of 1964 and fueled the Yanks run to the World Series, where he started three games against the Cardinals. That was the high point for The Needle, who stands seventh all-time in Yankee wins with 164, included three 20-win seasons. Stott had 40 career shutouts and hit an inside-the-park grand slam against Boston in 1965. 4. 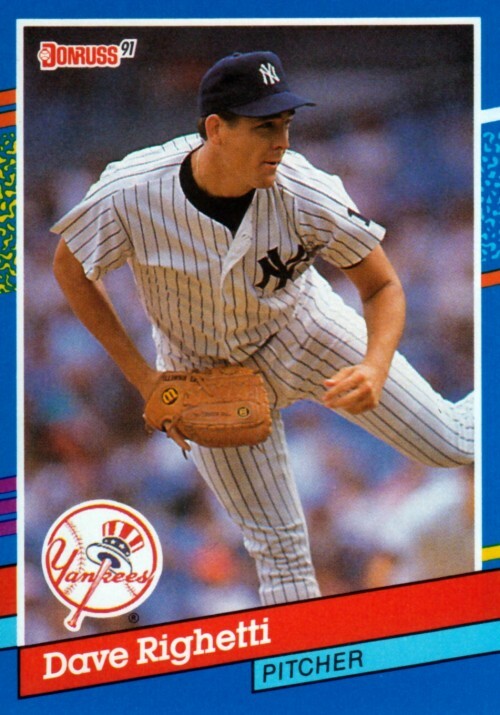 Dave Righetti — Pitched for the Yankees for 11 years before signing with the Giants as a free agent. He was AL Rookie of the Year in 1981 and threw a no-hitter against the Red Sox on the Fourth of July in 1983 before being moved to the bullpen. Rags racked up 224 of his 252 career saves as a Yankee, including a then MLB record 46 saves in 1986. 5. Mike Mussina — Signed away from Baltimore as a free agent, Mussina spent eight years in the Bronx and won 123 games (270 total). Moose came within one strike of pitching a perfect game against the Red Sox in 2001, and won 20 games for the first time in 2008, his final season, just missing out on the Yankees 27th championship. He did pitch in the World Series as 2001 and 2003. 6. Hal Chase — One of the Highlanders, Prince Hal, a great fielding first baseman with a corrupt side, recorded a .291 lifetime batting average and 363 stolen bases. He just missed out on a World Series after 1918, when the Reds traded him to the Giants. Chase came up to the majors in 1905, and played his first nine years in New York before being traded to the White Sox in 1913. 7. Tommy John — Pitched and lost to the Yankees in the 1977 and 1978 World Series before taking the if you can’t beat em join em approach and signing as a free agent. In two tours of duty with the Yankees TJ was 91-60, with 21 wins in 1979 and 22 in 1980. Overall John was 288-231 over a 26-year major league career that ended with the Yankees in 1979. 9. Lindy McDaniel — Joined the Yankees in 1968 and pitched for six years before being traded to the Royals in a move that brought Lou Piniella to the Bronx. McDaniel had 141 wins and 172 saves in a 21-year career. He led the Yanks with 29 saves in 1970, and overall was 38-29 with 58 saves for the Bombers. .
10. Phil Niekro — After spending his first 20 years throwing knuckleballs for the Braves, Knucksie signed with the Yankees in 1984, and recorded back to back 16-win seasons. On the final day of the 1985 season, Niekro, right, shut out the Blue Jays for his 300th win. He then left for the Indians, before winding up back in Atlanta in 1987. Niekro was inducted into the Hall of Fame in 1997. Tim Duncan and Shaquille O’Neal shared MVP honors at the 2000 NBA All-Star Game. But the real story was IBM’s Advance Scout, which used data mining to help NBA teams win. Some 13 years ago, IBM hosted a press conference at the 49th NBA All-Star Game, which took place at the Oakland Arena in California. We were flacking Advance Scout, a customized IBM data mining application that NBA teams were using to discover hidden patterns from data. It was in Sunday February, 13, 2000, shortly after the world survived Y2K. The Internet was just starting to become popular. Big data, the cloud and Smarter Planet weren’t ready for prime time. Advance Scout was developed by an IBM T.J Watson Center researcher, Dr. Inderpal Bhandari, an expert in data mining and later the founder and CEO of Virtual Gold, an IBM Business Partner. The innovative application was a trend-setter, a very early player in data analysis for non-technical users. At one point, some 25 NBA teams used Advance Scout to develop game plans and make real-time, game-time decisions. Data mining was credited with helping the Orlando Magic nearly pull off a playoff upset against the second-seeded Miami Heat in the first round of the 1997 NBA playoffs. And it helped the Toronto Raptors make the playoffs in 2000 before they were swept by the Knicks. In Oakland, IBM brought in about 10 newspaper and IT trade reporters, including the San Francisco Chronicle, the National Post of Canada, InfoWorld and PC Week, to a press event before the All-Star game. Dr. Bhandari participated along with the late Jim Kelly, an IBM marketing executive, and Brian James, then an assistant coach with the Raptors. In the All-Star Game that weekend, the Raptors’ Vince Carter won the slam dunk competition. The West beat the East 137-126. Tim Duncan and Shaquille O’Neal combined for 46 points and 23 rebounds and were named co-MVPs. Philadelphia’s Allen Iverson led all scorers with 26 points. One of my highlights was meeting Oscar Robertson on an elevator at the Fairmont Hotel in San Francisco.